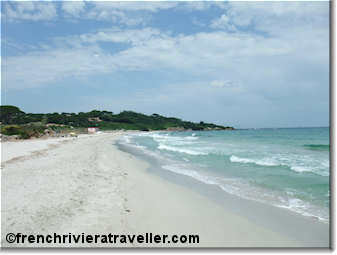 First-time visitors to Saint-Tropez are often confounded by the problem of how to reach the famous Saint-Tropez beaches. Sure there are a couple of measly beaches within walking distance of the old town but the sandy beaches that put Saint-Tropez on the map are a good 5km from the town center. If you have your own car, no problem. Traffic may slow you down but once there, there's ample parking on the Plage Pamplonne that costs €4-5 daily. Parking at Plage des Salins is free. But perhaps you have arrived in Saint-Tropez by bus or boat? In that case, you'll be relieved to know that Saint-Tropez does have a modest bus system, unheralded but convenient. VarLib runs line 7705 from the Saint-Tropez bus station to Pampelonne beach and on to Ramatuelle. The line runs only from April to the beginning of September. Line 7742 is less frequent but runs all year. The town of Saint-Tropez has a free shuttle minibus that runs from the Place des Lices in the town center to the town beaches, including the spectacular Plage des Salins. Check the schedule carefully and note that seniors and handicapped people have priority. The young and able-bodied may board if there is space.